In a face-to-face classroom, teaching and assessing language skills can be a formidable task. With the arrival of the digital era and online education, teachers have a new assignment―to teach and assess language skills online. Can language skills really be taught effectively online? If so, what strategies are most effective? Can these skills be properly assessed in the online environment? If so, how? This article explores strategies that can be used to effectively teach and assess the language skills of students in online language classes at the undergraduate and graduate levels. This section presents five strategies that can be used to teach language skills online: (1) video production, (2) online forum discussion, (3) Web conferencing, (4) Website creation, and (5) process writing. These strategies aim to develop the following language skills: listening, speaking, reading, and writing. 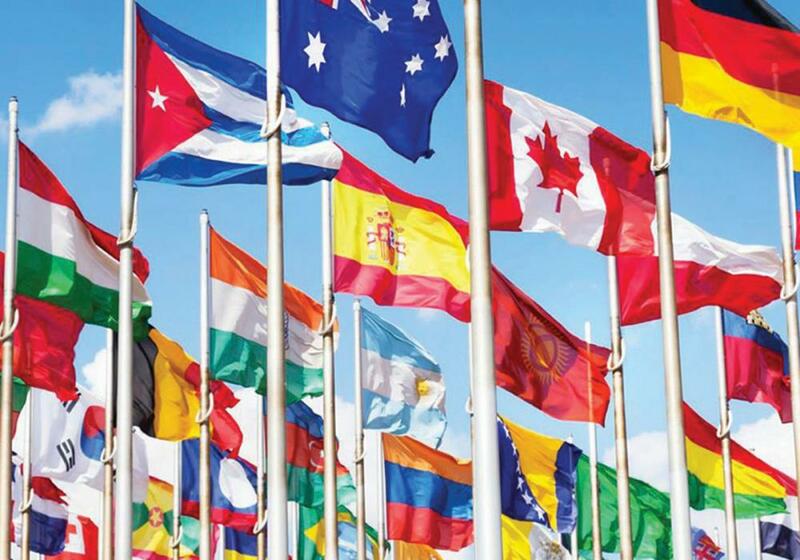 None of them focuses on one specific language skill, but rather endeavors, where possible, to integrate all of them. This strategy can be used by both teachers and students. The teacher can create video lectures, to which students respond by creating their own videos. In an online class, lectures can be prepared in written, audio, and/or video formats—or better yet, in all three modalities. Students may need to choose the written or audio format, depending on local conditions such as the strength or speed of the bandwidth offered by their Internet service provider. The video format, however, provides a stronger teacher presence, as it allows the instructor to model the different aspects of the language and to inspire students to attain the same level. Scene from a video depicting a tongue-twister demonstration. The professor next created performance videos modeling how to recite poems and speeches, after which the students did likewise and interpreted selected pieces. When one student submitted his video, the professor commented on how much his speaking skills had improved. The student explained that the results were worth the effort he put into the process. He watched several videos to listen and observe how other performers interpreted the piece, practiced for many hours, recorded numerous takes, and even asked friends to critique his performance. Other students, even those who started the class at an advanced level, revealed that they had gone through a similar process. This strategy encourages students to engage in a process of becoming proficient speakers of the language and mastering language skills based on the modeling provided by the teacher and others.1 In addition, video production provides the students with an opportunity for self-critique and reflection,2 essential skills in language learning. In the same class, using video production as a platform, the professor raised the requirements. Each student was assigned to train one or more persons to perform a selected literary piece. The students were told to select pieces that fit their trainees’ skill levels and personalities. Some arranged the pieces into a speech choir or a responsive reading. Keeping in mind the plot and theme of their selected pieces, the students chose the setting, sound track, choreography, and other elements that would enhance the performance of their trainees. After filming the performances, they uploaded their videos to YouTube and provided the link in Moodle so that the professor and the other members of the class could view them. Digital devices make it easy to integrate videos into the online classroom. Cameras, phones, tablets, and laptop computers are all capable of producing high-quality videos in formats that can be uploaded to the learning management system. Several tools can be used to produce videos from lectures, white-board illustrations, or even from the computer screen. Slideshow narration. Audio narration can be attached to PowerPoint (PC) or Keynote (iOS) presentations. Once the presentation is completed, select “Record Slide Show” to add voice-over audio to each slide. These presentations can also be saved as a movie. Helpful directions can be found here: Windows: http://bit.ly/2FlsC4w for Microsoft products; iOS: https://apple.co/2toTxqe for Mac products. Screencasting. Video tutorials can be shared using the screencasting technique, which allows the user to add a voiceover using step-by-step processes shown on the computer screen. Tools such as Adobe Captivate, Camtasia Studio, QuickTime player, or SangIt are just a few that can be used to create and edit the video segments. Animations. Add images and illustrations to video presentations by using software such as Adobe Voice and VideoScribe. These tools can help animate a video—some also provide music that can be included in the soundtrack. * Sandi Lin, “Three Easy Methods to Create eLearning Videos,” eLearning Industry (September 2014): https://elearningindustry.com/3-easy-methods-create-elearning-videos. The online teacher must strive to create an accepting and comfortable virtual classroom atmosphere because anxiety can be high in language classes.3 Video production can help online students build a sense of community and minimize anxiety levels. More than 18 years ago, Garrison et al.,4 in their groundbreaking seminal work, emphasized the need to foster social presence (which refers to students’ need to relate with one another and with the teacher at the social and emotional level), in the online environment. More recent studies on social presence have confirmed its importance in ensuring the success and satisfaction of students in online education.5 In the class mentioned earlier, the professor required the students to create three-minute videos to introduce themselves. Students attested that seeing and hearing their classmates helped them feel connected to one another. From the start of the class, it is important that students see each of their classmates as a real person, not just a name―an individual with a face and a voice. This helps to ensure that the virtual classroom atmosphere is supportive of learning. 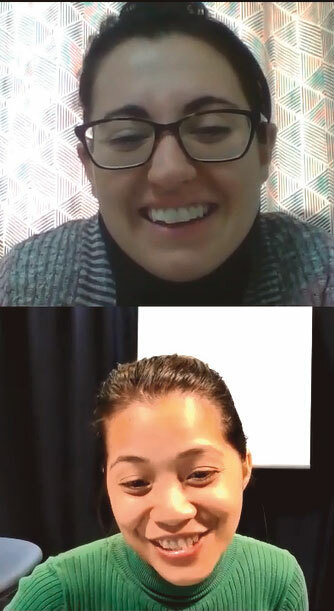 In addition, the professor designed the course so that each module began with a devotional time, where each student was assigned to present a two- to three-minute message and end with a short prayer recorded in video format.6 Then, using the video as a springboard, the class shared experiences and reflections. This exercise provided a venue for students to make connections using their language skills, not only on a personal level, but also on a spiritual one. Jose and Abidin cite Rouse’s definition of an online forum discussion (OFD) as “any online ‘bulletin board’ which is used by the participating writer to post or write his/her comments or opinion on a given topic expecting other participants to post their comments in response to what has been posted first.”7 In a typical online course at AIIAS, the professor posts two discussion questions for every module. The students are asked to respond once to each discussion question and at least twice to each of their classmates’ posts. In this platform, students utilize different communication strategies and hence use and develop a variety of skills. They explain, agree, disagree, defend their position, and question others’ ideas. In the process of doing so, they read to make informed responses and learn to cite sources both in the in-text and in the reference entries, thereby honing their critical-thinking and academic-writing skills. In an OFD, every student has the space and time to share his or her ideas.9 Because the quality and the number of students’ posts are carefully checked and evaluated by the teacher, and read by their peers, the students are motivated to respond. In an action research on OFD in an EFL context, Jose and Abidin found that “peer interaction and discussion played a major role . . . in promoting [students’] writing.”10 Students also learned how to exercise mutual respect when interacting with one another. The researchers explained that “in the OFDs, the learners are conscious of other members reading their ideas, seeing their possible grammatical or spelling errors.”11 Instructors should make sure that students are aware that both their peers and teacher will be reading and critiquing their skills. The syllabus is a good place to include this information. Also, instructors can model for students how to respond to other people in a respectful manner online. 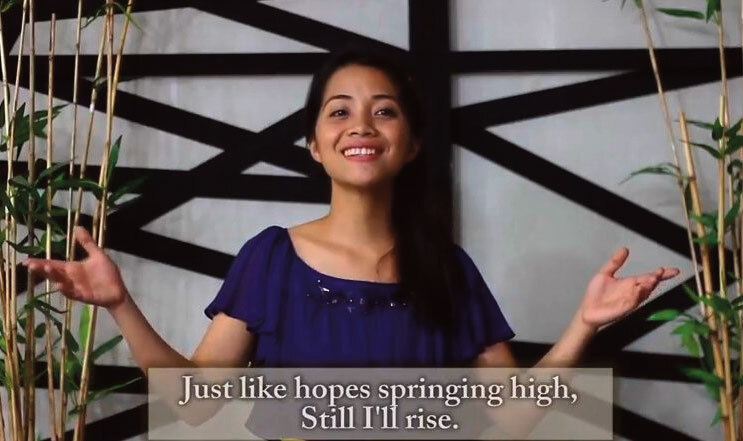 September Jane Ranarez’s video presentation of the poem “And Still I Rise”—written by Maya Angelou—is available at https://www.youtube.com/watch?v=_yxoQoVDago&t=20s. Synchronous Web conferencing, also known as video conferencing, is the online experience that most resembles face-to-face interaction. It can be delivered using different platforms such as Adobe Connect Pro, Blackboard Collaborate, Google Hangouts, Skype, WebEx, and Zoom, to name a few. This format works well for interactive lecture, group discussion, consultation, and free speech practice where students role-play given situations, or for controlled speech practice where students deliver/perform assigned materials. Synchronous Web conferencing has many benefits and advantages. Students can access synchronous meetings as long as they have an Internet connection; multiple sessions can be planned to accommodate students in different time zones; and most Web conferencing tools can be accommodated by LMS platforms. However, these advantages can become disadvantages when Internet service is poor, when time zones cannot be accommodated, or when the system does not work well with the LMS platform.12 Despite these technical concerns, synchronous Web conferencing helps build language skills through the use of built-in interaction tools that allow students to respond in real time, ask questions, and engage in active learning. According to Liang, “Online peer response that blends spoken, written, and electronic communication can promote student motivation, participation, and collaboration.”13 Synchronous Web conferencing, then, is especially useful for activities designed to develop listening and speaking skills because students must respond immediately, rather than relying on getting extra time to post or share their responses. Website creation involves choosing a Website building platform, creating and registering a domain name or Web address, selecting a graphic theme, and creating and organizing content.14 The first step is the selection of a building platform such as WordPress, Wix, Weebly, or Square, most of which are free, with a fee only if the user selects advanced features. Other basic steps in this activity include choosing the template and customizing the Website interface and functions. Most platforms provide step-by-step guidance to help users create essential components. The most important component of this activity, however, is the creation of content. At this step, students upload the materials required for the class. For a language class, these materials can be videos, journals, case studies, critical analyses, essays, and other materials such as blog posts. Moreover, in addition to journaling, students write thoughts and reflections in blogs. They can also link videos they have produced to the Website and, with permission, post relevant videos created by others or articles they may deem helpful to the language development of the entire class. Among their responsibilities are to screen and manage the materials posted on the Website, since these will form part of the basis for their grade. Is permission needed to use or reproduce the material? What kind of copyright is associated with the material? Will there be a fee for the educational use of the material? Once these questions are answered, the students will need to consider how long it will take to obtain permission. In some instances, it could take four to six weeks or more, so planning for permission early is important. Most importantly, the copyright owner’s permission should be in writing with the terms clearly stated.16 These steps are important and can help the student avoid fines and penalties for using or improperly citing materials that are protected by copyright law—and will also protect the teacher and educational institution from lawsuits. Video conference with online students using ZOOM. When creating Websites, students should identify relevant materials that will help them to develop their language skills. The self-regulated learning model posits that learners are capable of making decisions for themselves and, if motivated, can learn effectively once given the right tools.17 Creating a personal Website is an excellent tool in facilitating language learning. The students’ Websites can function as e-portfolios where they store all the work they have produced for the course and where they can upload pertinent resource materials they have obtained permission to use. Storing such materials online helps students to trace their learning and evaluate their growth in each of the language macro-skills (such as listening, speaking, reading, and writing)18 which is a metacognitive activity.19 In addition, the Web is a good place to store information because of its accessibility. Student Websites can also function as good venues for language acquisition and meaningful use it will be necessary for students to view videos and listen to audio recordings as they create their sites. They also learn to use language in context as they create blogs and respond to the comments posted on their blogs. Not only do they interact with their classmates and teacher, but they may also have broader contact with people from all over the world since the Website is accessible to the public.20 All these benefits are supported by Krashen’s input hypothesis, which states that learners increase their knowledge and understanding when they begin to comprehend language slightly above their current level,21 and Vygotsky’s socio-cultural theory, which claims that language is best learned in a social context. Furthermore, since Website creation is also one of the class projects, students may also benefit from working collaboratively to reach their desired level of language skills.22 Rubrics specifying expectations, assignment checkpoints at various stages of the project, and scheduled video conference progress meetings with students (whether with individual students or teams) are effective ways of making sure that students are submitting their own work and not that of another. A Website created by all the students in the classroom (whether individually or in groups), ensures that learning is shared by everyone in the class. Students can read one another’s work and reflections. As they work together, they build a community of learners. How can process writing be taught effectively in an online environment? Using video conferencing and the discussion forum, teachers can provide students with the necessary instruction. Another way is to incorporate the use of Google Docs, an application that enables teachers and students to collaborate. Among Google Doc’s features: It allows users to create documents; store and save automatically; share with other users; and edit, comment, and reply to comments synchronously (the class can work on the same document at the same time) or asynchronously. It also allows the user to view revision history. From the first step of planning―thinking of a topic and brainstorming among possible choices―to the final step of editing the written product, the class can engage in interactive feedback. Slavkov highlights one advantage of working on a writing project using Google Docs: “It allows instructors and peers to have a privileged view of the process of invention and creation in real time. That is, writers can be observed and can observe others as they write with Google Docs.”26 Dialogue with the teacher and peers that occurs while the student engages in process writing helps to promote better choices in many aspects of writing (e.g., word selection, sentence structure) and stimulates idea generation. According to Todd29 self-assessment is an essential element in self-directed learning because a prime goal should be to develop learners’ autonomy.30 Teachers can use several approaches to encourage students to engage in self-monitoring and self-correcting.31 In a speaking class, one strategy that has been used successfully is teaching students to use the dictionary, understand sound and stress symbols, and interpret them.32 Teachers and students can create either audio or video recordings to effectively demonstrate correct pronunciation.33 Firth recommends choral reading to help students fine-tune their speaking skills. This can be done effectively through a synchronous lesson in which the teacher models pronunciation skills for the students. As follow up, students can create an audio or video recordings of themselves reading assigned pieces. Recording their reading allows them to listen to their own speech, and with each replay, to identify areas for improvement such as pronunciation.34 Video and audio recordings are just some of the online self-assessment strategies that enable students to self-critique their progress, based on samples and rubrics provided by the professor. Journaling is another strategy that provides an opportunity for self-assessment. Students may respond to the following questions at the end of each lesson: What went well? What can be improved? What will I do to address areas needing improvement? These questions allow students to reflect on their strengths and weaknesses, to explore areas for growth, and to resolve to act on possible solutions. (See article on e-journaling by Prema Gaikwad on page 23 of this issue). 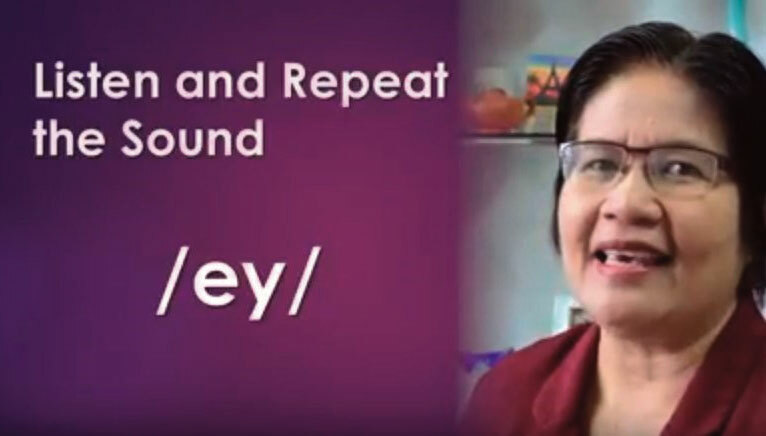 In this video clip, the teacher is modeling how to produce the /ey/ sound. Through peer assessment, students learn to evaluate the quality of another person’s performance using set criteria or goals, after which they provide suggestions for improvement.35 This type of assessment works well in activities such as coaching and peer feedback. • Coaching. Coaching is an effective way to provide formative peer feedback through suggestions rather than correction.36 Through peer coaching, students receive important suggestions on how to expand or refine their ideas and improve their performance in various learning tasks. These suggestions should be offered in a confidence-building, non-threatening way. Instructors should model effective ways of offering suggestions to correct, and also be prepared to intervene if peers are being harsh and critical. Questions such as “And what happens next?” or “What do you mean?” help students fine-tune their performance, build new skills, share ideas, teach one another, and solve problems.37 Coaching helps students set goals for their learning, identify their strengths and overcome their weaknesses, and develop a plan for action. Like other requirements, this peer-assessment strategy should be completed using a rubric. Students are divided into pairs and given specific instructions on how to assess the assignment, guided by the rubric. This not only gives them an authentic experience of how to critically examine the work of others, but also helps develop their ability to receive constructive feedback and develop a sense of accountability and responsibility for the feedback given to others. Coaching is ideal for big online classes where there are many participants who can be paired during coaching exercises. • Peer review. A peer is generally defined as someone who occupies a similar position or ranking or someone who is tasked with the same assignment—a colleague or teammate. During peer review, students completing the same assignment provide corrective feedback based on a rubric and assignment guidelines. This approach works best for academic writing. It is summative in nature, typically taking place as an assignment is nearing completion. Students are assigned partners and given specific instructions on how to provide feedback. The process allows students to review a particular classmate’s work, give feedback on the content and formatting (which needs to be explained in the rubric), and edit other parts that need further corrections. Evaluating another person’s work with respect and care involves a number of higher-level cognitive skills. Students are better able to evaluate their own work and discover new ideas when they have observed and reflected on a range of approaches during peer review. Online interaction provides the facilitator with a variety of opportunities to assess student learning. By actively facilitating the threaded discussions, the teacher can monitor the individual performance of students. Students in online courses at AIIAS attest that when professors (also called course facilitators) give timely and comprehensive feedback, their understanding of important concepts is deepened, and they are encouraged to engage in meaningful discussions. The use of rubrics increases student participation and enhances the quality of student output. The Web has almost endless possibilities as an instrument for language assessment.38 One form of Web assessment is video conferencing through software such as Zoom, Skype, or Google Hangouts. Video conferencing enables teachers and students to have real-time interaction and to engage in activities that assess language skills. Other platforms, such as Blackboard, Canvas, D2L, Edmodo, Moodle, et cetera, enable the teacher to conduct quizzes and exams online and to provide immediate feedback. There are a number of ways to teach and assess language skills online, but the strategies discussed in this article are basic best-practice approaches in an online modality. With strong technical support39 and faculty development,40 this modality can be very effective. 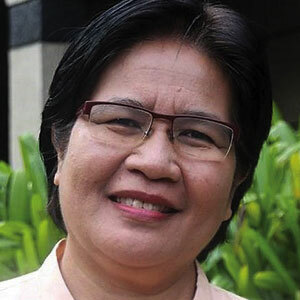 Arceli Rosario, PhD, is an Associate Professor in the Graduate School at the Adventist International Institute of Advanced Studies (AIIAS) in Silang, Cavite, Philippines. Dr. Rosario currently serves as Chairperson of the Education Department and teaches educational administration and TESOL courses. 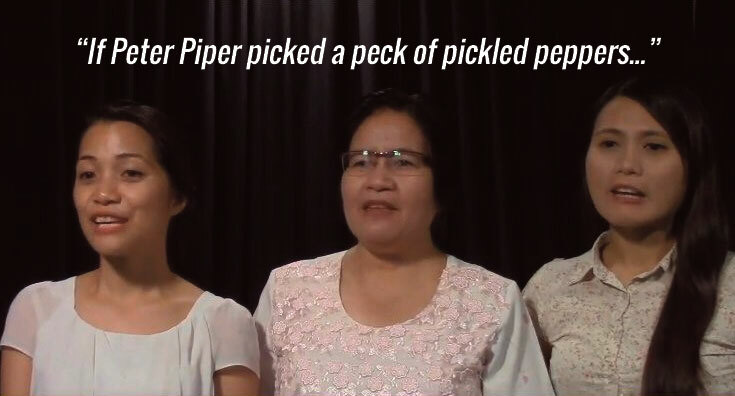 She earned her doctorate from the University of San Carlos in Cebu City, Philippines. Irene Rivera, MAEd, is the Online Course Development Assistant of the Division of Online Learning at AIIAS. She earned her Master’s degree at the Adventist University of the Philippines in Cavite, Philippines. Her research interests are in the areas of language learning and teaching, computer-mediated communication, and online learning. 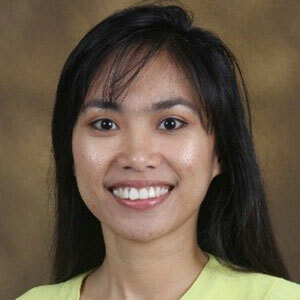 Sheri Joy Namanya, BA, is a graduate student in the MA Education ‒ TESOL program at AIIAS. 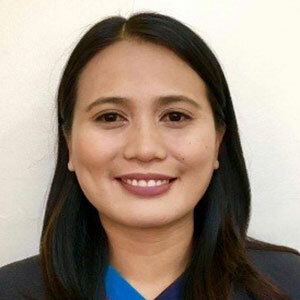 She earned her English language degree from Mountain View College in Valencia City, Bukidnon, Philippines. Her experiences in teaching English at different levels in three different countries help to explain her interest in cultures, second-language acquisition, and English-language teaching strategies. Arceli Rosario, Irene Rivera, and Sheri Joy Namanya, “Teaching and Assessing Language Skills Online,” The Journal of Adventist Education 80:2 (April-June 2018): 15-22. Lev S. Vygotsky, “Interaction Between Learning and Development.” In Mary Gauvain and Michael Cole, eds., Readings on the Development of Children (New York: Worth Publishers, 2008), 34-40: http://www.colorado.edu/physics/phys4810/phys4810_fa08/4810_readings/vygot_chap6.pdf. Martina Lindseth and Joshua R. Brown, “An Uplifting Experience: A Course Sequence Designed to Facilitate Proficiency Development,” A Journal of the American Association of Teachers of German 47:1 (March 2014): 49-55. Stephen D. Krashen, Principles and Practice in Second Language Acquisition (2009): http://www.sdkrashen.com/content/books/principles_and_practice.pdf. D. Randy Garrison, Terry Anderson, and Walter Archer, “Critical Inquiry in a Text-based Environment: Computer Conferencing in Higher Education,” The Internet and Higher Education 2:2/3 (Spring 1999): 87-105. Elham Alsadoon, “The Impact of Social Presence on Learners’ Satisfaction in Mobile Learning,” Turkish Online Journal of Educational Technology (TOJET) 17:1 (January 2018): 226-233; Jamie Costly, “The Effects of Instructor Control on Critical Thinking and Social Presence: Variations Within Three Online Asynchronous Learning Environments,” The Journal of Educators Online 13:1 (January 2016): 109-171: https://files.eric.ed.gov/fulltext/EJ1087694.pdf; Mithat Elcicek, Husamettin Erdemci, and Hasan Karal, “Examining the Relationship Between the Levels of Digital Citizenship and Social Presence for the Graduate Students Having Online Education,” Turkish Online Journal of Distance Education 19:1 (January 2018): 203-214: https://files.eric.ed.gov/fulltext/EJ1165855.pdf; Julie A. Gray and Melanie DiLoreto, “The Effects of Student Engagement, Student Satisfaction, and Perceived Learning in Online Learning Environments,” NCPEA International Journal of Educational Leadership Preparation 11:1 (May 2016): 1-20: https://files.eric.ed.gov/fulltext/EJ1103654.pdf. Students enrolled in this course were Seventh-day Adventist Christians or members of another Christian religious group. Instructors should be prepared with alternate options for this assignment should a student feel uncomfortable with the requirement or is unwilling to participate because of his or her religious beliefs. Jose Jayaron and Mohammed Jafre Zainol Abidin, “A Pedagogical Perspective on Promoting English as a Foreign Language Writing Through Online Forum Discussions,” English Language Teaching 9:2 (January 2016): 85, 83-101. Linda Macaulay and La Tonya Dyer, “Interactive Web Conferencing Brings Big Benefits to the Online Classroom,” Faculty Focus Higher Ed Teaching Strategies from Magna Publications (November 14, 2011): www.facultyfocus.com/articles/teaching-with-technology-articles/interactive-web-conferencing-brings-big-benefits-to-the-online-classroom/. Jayaron and Abidin, “A Pedagogical Perspective on Promoting English as a Foreign Language Writing Through Online Forum Discussions,” 93. Mei-Ya Liang, “Using Synchronous Online Peer Response Groups in EFL Writing: Revision-related Discourse,” Language learning & Technology 14:1 (February 2010): 45-64: http://llt.msu.edu/vol14num1/liang.pdf. Robert Mening, “How to Make a Website: An Easy, Step-by-step Guide From a Web Developer” (2017): https://websitesetup.org/. Rich Stim, “Copyright and Fair Use: The Basics of Getting Permission,” Stanford University Libraries (2018): https://fairuse.stanford.edu/overview/introduction/getting-permission/. Hope J. Hartman, “Teaching Metacognitively,” in Hope J. Hartman, ed., Metacognition in Learning and Instruction: Theory, Research, and Practice (Manhattan, N.Y.: Springer, 2001); Philip H. Winne and Allyson F. Hadwin, “Study as Self-regulated Learning,” in Douglas J. Hacker, John Dunlosky, and Arthur C. Graesser, eds., Metacognition in Educational Theory and Practice (New York: Routledge, 2009). Eridafithri, “The Application of Portfolios to Assess Progress in Writing of EFL Students at Secondary Schools in Banda Aceh,” Studies in English Language and Education 2:1 (March 2015): 1-16: http://files.eric.ed.gov/fulltext/ED560163.pdf. Sami Al Nassar Al-wossabi, “Promoting Communicative Skills and Cultural Understanding Among Saudi EFL Students Joining Summer English Programs at US Universities: A Web-based Project,” Advances in Language and Literary Studies 7:6 (December 2016): 36-45. doi: 10.7575/aiac.alls.v.7n.6p.36/. Krashen, Principles and Practice in Second Language Acquisition. Masoud Azizinezhad, Masoud Hashemi, Sohrab Darvishi, “Application of Cooperative Learning in EFL Classes to Enhance the Students’ Language Learning,” Procedia Social and Behavioral Sciences 93 (October 2013): 138-141. doi: 10.1016/j.sbspro.2013.09.166; Dorota Domaleska, “Technology-supported Classroom for Collaborative Learning: Blogging in the Foreign Language Classroom,” International Journal of Education and Development Using Information and Communication Technology 10:4 (October 2014): 21-30: http://ijedict.dec.uwi.edu/viewarticle.php?id=1758; Supyan Hussin et al., “Exploring Instructors’ Rationale and Perspectives in Using Blogs as a Tool for Teaching English as a Second Language,” English Language Teaching 9:10 (September 2016): 142-155. doi: 10.5539/elt.v9n10p142. Anthony Seow, “The Writing Process and Process Writing.” In Jack C. Richards and Willy A. Renandya, eds., Methodology in Language Teaching. An Anthology of Current Practice (Cambridge, U.K.: Cambridge University Press, 2002). Vygotsky, “Interaction Between Learning and Development,” 34-40. Fergal Carolan and Anna Kyppö, “Teaching Process Writing in an Online Environment.” In J. Jalkanen, E. Jokinen, and P. Taalas, eds., Voices of Pedagogical Development―Expanding, Enhancing, and Exploring Higher Education Language Learning (Dublin: Research-publishing.net, 2015): 15, 13-30. doi: 10.14705/rpnet.2015.000285. Nikolay Slavkov, “Sociocultural Theory, the L2 Writing Process, and Google Drive: Strange Bedfellows?” TESL Canada Journal 32:2 (2015): 80-94. Yuko Goto Butler and Jiyoon Lee, “The Effects of Self-assessment Among Young Learners of English,” Language Testing 27:1 (January 2010): 5-31. Ruth Deakin-Crick et al., Systematic Review of Research Evidence of the Impact on Students of Self and Peer Assessment (London: EPPI-Centre, 2005). Richard Watson Todd, “Using Self-assessment for Evaluation,” English Teaching Forum 40:1 (January 2002): 16-19. J. Charles Alderson and Dan McIntyre, “Implementing and Evaluating a Self-Assessment Mechanism for the Web-based Language and Style Course,” Language and Literature 15:3 (August 2006): 291-306. Marc Bloom, “Self-regulated Learning: Goal Setting and Self-monitoring,” The Language Teacher 37:4 (July/August 2013): 46-50: https://www.jalt-publications.org/files/pdf-article/37.4tlt_art2.pdf; Sue A. Ingels, “The Effects of Self-monitoring Strategy Use on the Pronunciation of Learners of English.” PhD diss., University of Illinois at Urbana-Champaign, 2011; Abdul Majid Khan Rama and Uzma Perveen, “Motivating Students Through Self-correction,” Educational Research International 2:2 (October 2013): 192-196: http://www.erint.savap.org.pk/PDF/Vol.2(2)/ERInt.2013(2.2-23).pdf; Carolyn Samuel, “In the Classroom Pronunciation Pegs,” TESL Canada/Revue TESL Du Canada 27:2 (Spring 2010): 103-113: http://files.eric.ed.gov/fulltext/EJ924063.pdf; Kulawadee Yamkate and Charatdao Intratat, “Using Video Recordings to Facilitate Student Development of Oral Presentation Skills,” Language Education in Asia 3:2 (2012): 146-158: https://camtesol.org/Download/LEiA_Vol3_Iss2_2012/LEiA_V3_I2_03_Yamkate_Intratat_Using_Video_Recordings_to_Facilitate_Student_Development_of_Oral_Presentation_Skills.pdf. Albert H. Marckwardt, “Getting the Most Out of the Dictionary,” English Teaching Forum 50:4 (2012): 39-45: https://americanenglish.state.gov/files/ae/resource_files/50_4_9_marckwardt.pdf; Rastislav Metruk, “The Use of Electronic Dictionaries for Pronunciation Practice by University EFL Students,” Teaching English With Technology 17:4 (2017): 38-51: https://files.eric.ed.gov/fulltext/EJ1159099.pdf. Kulawadee Yamkate and Charatdao Intratat, “Using Video Recordings to Facilitate Student Development of Oral Presentation Skills,” Language Education in Asia 3:2 (2012): 146-158: https://camtesol.org/Download/LEiA_Vol3_Iss2_2012/LEiA_V3_I2_03_Yamkate_Intratat_Using_Video_Recordings_to_Facilitate_Student_Development_of_Oral_Presentation_Skills.pdf. Suzanne Firth, “Developing Self-correcting and Self-monitoring Strategies,” in Peter Avery and Susan Ehrlich, eds. Teaching American English Pronunciation (Oxford, U.K.: Oxford University Press, 1992), 219, 215-220. Keith J. Topping, “Peers as a Source of Formative and Summative Assessment,” in James H. McMillan, ed., SAGE Handbook of Research on Classroom Assessment (Los Angeles, Calif.: Sage, 2013), 395-412. Keith J. Topping and Steward Ehly, Peer-assisted Learning (Mahwah, N.J.: Lawrence Erlbaum Associates, 1998), 15-18. Charles L. Slater and David L. Simmons, “The Design and Implementation of a Peer Coaching Program,” American Secondary Education 29:3 (Spring 2001): 67-76. Magdolna F. Silye and Troy B. Wiwczaroski, A Critical Review of Selected Computer Assisted Language Testing Instruments (Debrecen, Hungary: University of Debrecen, 2002): http://www.date.hu/acta-agraria/2002-01i/fekete1.pdf. 39. For more on providing technical support for online programs, see Janine Monica Lim’s article “Administrative Essentials for Online Programs,” The Journal of Adventist Education 80:1 (January-March 2018): 4-10. For more on supporting online teachers through faculty development and training, see La Ronda Forsey’s article “How to Successfully Support Online Teachers,” ibid., 11-15.